Return to the days when the 426 Hemi® ruled not only the NASCAR world, but the streets as well. This dual quad intake manifold is a faithful reproduction of the legendary 426, but uses all-new tooling to give you the lethal combination of historic performance through modern technology. 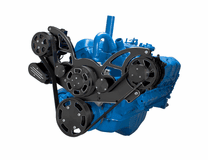 The BEASTTM 8 Track Serpentine System for Chrysler Big Block engines with Air Conditioning and Power Steering. CVF Racing's 8 Rib Serpentine pulleys increase grip, reduce stretching and prevent slippage compared to traditional 6 Rib designs. The BEASTTM 8 Track Serpentine System for Chrysler Big Block engines with alternator only. CVF Racing's 8 Rib Serpentine pulleys increase grip, reduce stretching and prevent slippage compared to traditional 6 Rib designs. Uses original or aftermarket clockwise rotation water pump to help save you money. 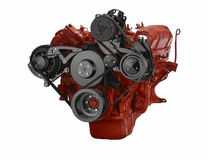 The BEASTTM 8 Track Serpentine System for Chrysler Big Block engines with alternator and power steering. CVF Racing's 8 Rib Serpentine pulleys increase grip, reduce stretching and prevent slippage compared to traditional 6 Rib designs. 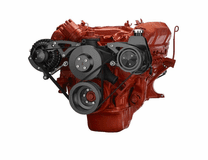 At CVF Racing our alternators are specifically designed to work with pulleys at low RPM so you can be certain that your alternator will charge throughout the RPM range. A lot of high amp alternators just shift the RPM range higher to get more power at the expense of low end charging. 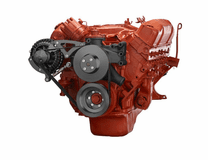 Our alternators are assembled and tested in the USA with the highest quality components and guaranteed to get you home. 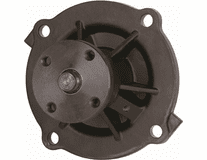 We use high quality insulating materials to keep your alternator running at high amps. 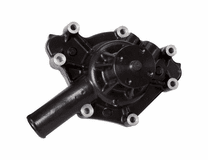 This mechanical water pump is designed to have a black pump finish and to have maximum flow distribution. 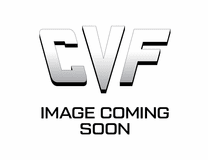 It is designed for use with factory alternators, power steering brackets, and CVF racing brackets. Made with aircraft quality 6061-T6 billet aluminum, this pump is designed to provide a perfect fit for your Chrysler Small Block engines. It is cut using CNC machining, which provides additional accuracy and a more sturdy construction. This process is also faster and more cost effective, making this short water pump an incredibly affordable option. 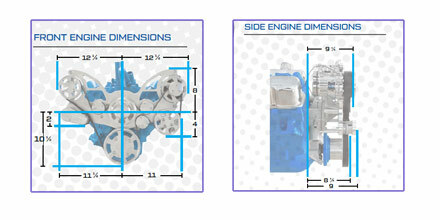 All these procedures and materials come together to create a 30% smoother Serpentine System. This pump is incredibly efficient, built for longevity, and carefully crafted to increase the performance of your Chrysler serpentine system. 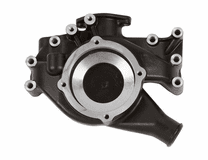 We proudly manufacture all of our Chrysler aluminum water pumps right here in the United States and pass the savings on to you. We offer a flat rate on our shipping of $9.85, which applies to unlimited quantities. Reach out to us for any questions and concerns you have. This mechanical water pump housing is designed with a black pump finish and machined bolt locations so that you don't damage the paint when tightening bolts. It is designed for use with factory alternators, power steering brackets, and CVF racing brackets. Made with lightweight aluminum, this pump housing is designed to provide a perfect fit for your Chrysler Big Block engines. This pump is incredibly efficient, built for longevity, and carefully crafted to increase the performance of your Chrysler cooling system. We offer a flat rate on our shipping of $9.85, which applies to unlimited quantities. Reach out to us for any questions and concerns you have. This mechanical water pump is designed to have a black pump finish and to have maximum flow distribution. It is designed for use with factory alternators, power steering brackets, and CVF racing brackets. Made with aircraft quality 6061-T6 billet aluminum, this pump is designed to provide a perfect fit for your Chrysler Big Block engines. It is cut using CNC machining, which provides additional accuracy and a more sturdy construction. This process is also faster and more cost effective, making this short water pump an incredibly affordable option. All these procedures and materials come together to create a 30% smoother Serpentine System. This pump is incredibly efficient, built for longevity, and carefully crafted to increase the performance of your Chrysler serpentine system. We offer a flat rate on our shipping of $9.85, which applies to unlimited quantities. Reach out to us for any questions and concerns you have. All Inclusive WRAPTORTM 8 Track Serpentine System for AMC & Jeep V8 engines with 140 Amp alternator and Peanut Style AC compressor. CVF Racing's 8 Rib Serpentine pulleys increase grip, reduce stretching and prevent slippage compared to traditional 6 Rib designs. Spring loaded Gates tensioner ensures proper tension during hard acceleration and deceleration while compensating for belt stretch. Places alternator on the driver's side above the power steering pump. Upgrade to Power Steering Only Requires Pump, PS Pulley and Belt Purchase.